Hooked up my new pixie 4 controller to my PC. Hooked up 16 channel controller and computer saw it. Disconnected and hooked up pixie 4. Computer can’t find it and light flashing red on controller. Am I missing something? I assume you are using a LOR RS485 dongle (and not DMX mode) ? Did you try the other RJ45 on the Pixie? Are the 4 jumpers in LOR mode? Should the lights come on when I press the reset/test button? If so, they are not. I would not use the "Reset/ Test" button, there is absolutely almost no need to. To save time do a search and look for the subject "Pixie16 Help" within the first page you will find my steps to configure your pixie4, same steps just more unit ID's. Do not rely on HU for much more than a back door test to the controller. It will make lights work as long as the HU recognizes the Unit ID, it does not mean once you close down HU that you are good to go. On the contrary there is a lot more work to do. Got up this morning and I think I did all I could find. I reinstalled the driver. Restarted computer. Tried both rj45 ports. Again 16 channel LOR connects fine. Just new pixie4 won’t connect. should I open a help desk ticket? I would. That LED blinking says it is not seeing the network. If you follow my aforementioned post you will resolve your issue. Did you read and follow my instructions step by step? Something tells me you didnt or you figured once you got to a certain point you bypassed the rest. Trust me, I’ve seen many I helped do exactly that. This is the first 2 that come up. The rest do not pertain to what we are talking about as far as I can tell. I went through these 2 pages and there wasn’t any specific help there. I found a troubleshooting page on LOR and it had me reboot reinstall restart and all the other re’s but non of that helped. cluld you be a little specific about where this information may be that you guarantee can fix it? Also if it helps, I cannot chance the unit ID. It also says unable to locate. Or provide me with a cell # in private message and I will call you. I am setting up but can still walk you through the process. Your controller unit I’d is not changing because you probably have the dip switch from the factory to on. do not have more than one controller connected while trying to configure the controllers. I am on my cell, unable to link you to my step by step. 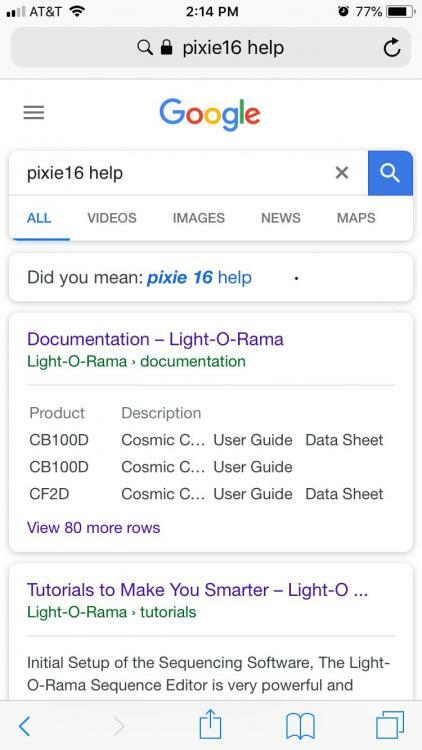 Type in “pixie16 Help “ also try “pixel 16 help” sometimes new people get the pixie and pixel name confused. Trust me if there was a way I could link you to it I would. Shoot me your cell on pm.